I think my husband, teens, and I have managed to see every Adam Sandler movie ever made, some multiple times, mostly thanks to Netflix. Somehow Adam Sandler has made a hugely successful career out of playing more or less the same guy in every film, yet his characters do grow and learn a few life lessons during each story arc, and there's something compelling about Sandler that resonates with the modern, American "everyman" archetype. If you're a fan, you're in luck. This month you can catch the man's comedic stylings live and on Netflix. 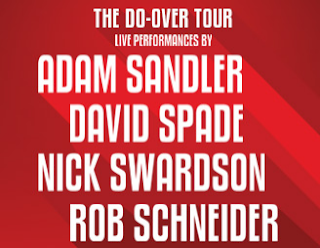 With the addition of David Spade and Nick Swardson hilarity is sure to ensue. Netflix is sending Adam Sandler and his fellow THE DO-OVER stars David Spade and Nick Swardson on the road, along with longtime Sandler collaborator Rob Schneider, for The Do-Over Tour, where the comedians and longtime pals will deliver live performances for their fans. The seven-city tour kicks off May 19 in San Francisco. The Do-Over Tour comes to The Chicago Theatre Monday, May 23, 8pm. Tickets start at $45. 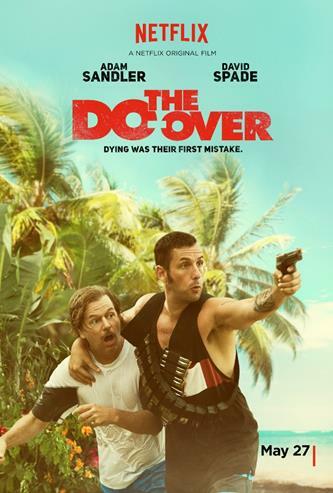 THE DO-OVER will be available on Netflix May 27. In THE DO-OVER, Adam Sandler plays “Max” and David Spade plays “Charlie,” old friends tired of their mundane lives who reunite at their 25th high school reunion for the ultimate mulligan: they decide to wipe the slate clean for a do-over. After faking their deaths and assuming new identities, could their lives be better the second time around? THE DO-OVER, the second of four films in Sandler’s deal with Netflix, also stars Paula Patton, Sean Astin, Renée Taylor, Luis Guzmán, Kathryn Hahn, Michael Chiklis, Catherine Bell, Natasha Leggero, Torsten Voges and Matt Walsh. It was directed by Stevin Brill from a script penned by Kevin Barnett and Chris Pappas.